The Little Giant 22-Foot Velocity Multi-Use Ladder is one to beat in the market of ladder selections. Its versatility brought about its 5-way design with 33 configurations make it ideal for any type task in commercial or residential buildings. This ladder has all the features you need to ensure durability, stability, flexibility, and comfort. Such are the reasons why the Velocity is the best option for homeowners, contractors, and DIY-ers. The Little Giant 22-Foot Velocity Multi-Use Ladder, 300-Pound Duty Rating is a professional-grade multi-purpose ladder that features a convertible design with 33 configurations. Available in two other models with 16 and 24 configurations. The Velocity also features great strength and durability with its aluminum construction. As for stability, the dual-pin hinge of the ladder has got this covered. Adjustments are simple and easy with the Rock Locks; changing configurations will only require pushing the lock to release it, adjusting the desired configuration, then tapping the lock mechanism for a relock. Many people have a lot of good things to say about the Velocity. The best feature of this ladder is its convertible design. This patented design enables the user to utilize the ladder as a scaffolding, 90-degree ladder, staircase ladder, extension ladder, and A-frame ladder. With such, you can safely and comfortably reach the ceiling and other high locations. You can also use the ladder amidst other obstacles that a standard ladder cannot accommodate. The Velocity is constructed with wide rungs to guarantee comfort by reducing fatigue and foot pain. It also contributes to better stability while you work on the ladder. For safety when climbing, the Velocity is made with deep treads for maximum traction. Furthermore, it has wide-flared legs to guarantee both stability and safety. For easy transport, you will benefit from the Velocity’s Tip and Glide wheels. Instead of carrying or dragging it from one location to another, you can wheel it around instead. This reduces the hassle and the risk of dropping the ladder and damaging structures along the way. Shifting from one configuration to another is easy with the Rock Lock system of the Velocity. Push, adjust, and tap are all the actions you need for an easy and hassle-free adjustment of the height and position of the ladder. The Velocity can be configured into a stepladder, which you can utilize in stairways, uneven ground, and over other obstacles. The Velocity can be extended up to a maximum of 19 feet through its dual-pin hinge. You can reach high places including roof lines, ceilings, and other areas that are hard to reach with standard ladders. This is the ladder design ideal for the Velocity when you will be storing it. Its 9-inch slim design makes it easy to store. You can work leaning against a vertical surface such as the wall with the 90-degree design of the Velocity. This enables you to work closer at the task at hand. This makes the Velocity easy to transport from one job location to another. Who Needs the Little Giant 22-Foot Velocity Multi-Use Ladder? 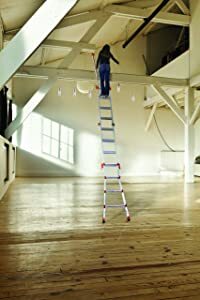 If you are a DIY-er, general contractor, building painter, or simply a homeowner, the Little Giant 22-Foot Velocity Multi-Use Ladder is the ideal ladder to help you complete your painting and repairing tasks. It gives you the stability that you need to keep you safe when reaching certain heights and working on different surfaces. Even with obstacles such as uneven grounds and vertical surfaces, the Velocity is an excellent tool for accomplishing your tasks. So whether you are a homeowner or professional contractor, the Little Giant 22-Foot Velocity Multi-Use Ladder is a companion that you need for safe, comfortable, and convenient task completion. 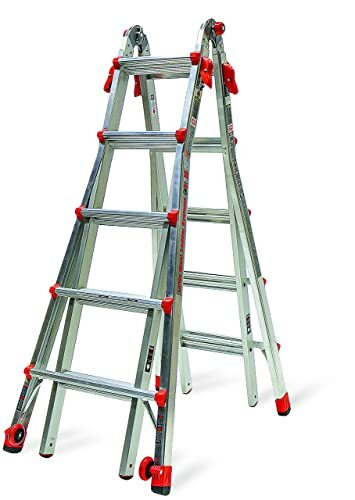 This ladder is one for you if you want great control over the heights and distances that you need to reach to ensure the quality of your work. Customer Reviews: What Do Buyers Say About the Little Giant 22-Foot Velocity Multi-Use Ladder? If you want take a closer look at the Velocity before you proceed with your purchase, there are reviews that you can read over the internet. 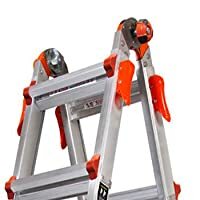 Amazon is one good place to find what actual customers have to say about the quality and functionality of the ladder. Currently, this product has received 819+ customer reviews, with 83% of the customers extremely satisfied with the quality of the Velocity. Many customers highlighted the flexibility and great quality. One customer even exclaimed that it was worth its value. A few customers had a different reaction to the ladder, however. They awarded the Velocity 1 to 3 stars, which is a small percentage compared to those who have rated the ladder 4 to 5 stars. With this amount of positive feedback for the Velocity, it is not hard to see why it is one of the best options to invest in. The downside that some Amazon customers talk about its weight and price. However, the wheels of the ladder make up for the weight. They have been installed to make it easy for anyone to move the ladder. As for the price, it is worth paying for with all of the features and the 5-way design. All of the ladder types you need are present in one model and that is the Velocity. With the multitude of good reviews about the Velocity, it is one product to look out for. Still, the decision will be up to you based on your assessment of the ladder considering its suitability to your needs and budget. The most admirable features of the Velocity are its several configurations with its 5-way design that provide versatility and its simple but effective lock system., which are exactly the reasons why many customers are fond of it. Even though it has some shortcomings, it is highly-recommended for its multi-use feature.